The high share of short-term funds amidst the low share of medium and long-term funds makes the economy fall short of resources to ensure sustainable development. Capital markets still heavily depend on bank credits. Therefore, increasing the role of non-bank funds in the market is important for sustainable economic development. 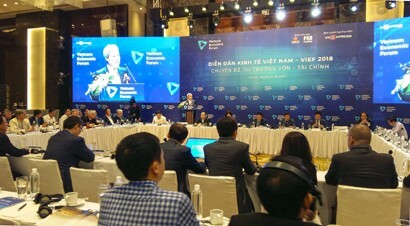 This is the statement of Deputy Prime Minister Vuong Dinh Hue at the Vietnam Economic Forum (ViEF 2018) on capital and financial markets themed “Expanding capital and financial markets in Vietnam - Solutions and challenges” held recently in Hanoi. At present, the size of Vietnam's financial system remains modest compared to its peers in the region, especially its limited funding capability, thus not fully utilising its role as a funding channel of the economy. The capitalisation rate from such markets as real estate and securities is limited. Bond structure is unbalanced. According to the General Statistics Office (GSO), as of February 31, 2018, up to 53 per cent of active enterprises in Vietnam are unprofitable partly because of insufficient working capital. Many businesses now mainly rely on bank funds to operate. As investment projects have a low share of owned capital, their financial costs are very high. According to many experts, to restructure capital sources, it is essential to gradually reduce bank credit, increase non-bank fund from capital markets, enhance long-term capital capacity for businesses, raise the transparency of stock and bond markets. Strict sanctions should be used to individuals or companies with signs of taking over and manipulating stock prices that ruin investor confidence in this very important funding channel. Speaking of restructuring solutions, Mr Andy Ho, CEO of VinaCapital Group, highlighted a transparent legal and regulatory environment to enhance the role of non-bank institutions in providing capital for the market. He added that Vietnam could appoint a trust fund or a trust body to invest in corporate bonds to create a sense of comfort and peace of mind when investors buy shares. However, share and bond market solutions are still only good to large enterprises, while 97 per cent of Vietnamese enterprises are small and medium. Bank loans still strictly require security assets. In this regard, Mr Nguyen Kim Hung, Director of Vietnam Enterprise Restructuring Joint Stock Company, emphasised that the actual capital of small and medium-sized enterprises (SMEs) only accounts for 20 - 30 per cent, while the rest is contributed by relatives and friends of the owner. When banks refuse and government bonds are inaccessible, they are forced to use unofficial funds. “Just typing “cho vay vốn” (lending money) on the Google search engine, we will find up to 20 million results. The market has many types of loans but the cost is relatively high,” he said. Referring to solutions, Hung hoped that the Government can create a legal framework for SMEs to access this source of capital legally. According to statistics, the expense of using unofficial capital amounts to over 10 per cent but it is not entered as eligible expenditure item. Developing secondary capital markets and applying modern technologies for SMEs to access to informal capital was also addressed by speakers. We can apply such technologies as blockchain to make SME assets acceptable for loan, while being unacceptable in formal credit channels. Mr Kim Hung said that there is a need to digitise the economy, develop secondary capital markets and digitise unemployed money by using blockchain and artificial intelligence (AI) to create a platform suitable for each group of businesses in the same field. Supply chains can share assets and the capital is put into effective use. Besides, it is necessary to draw unemployed money among the population.